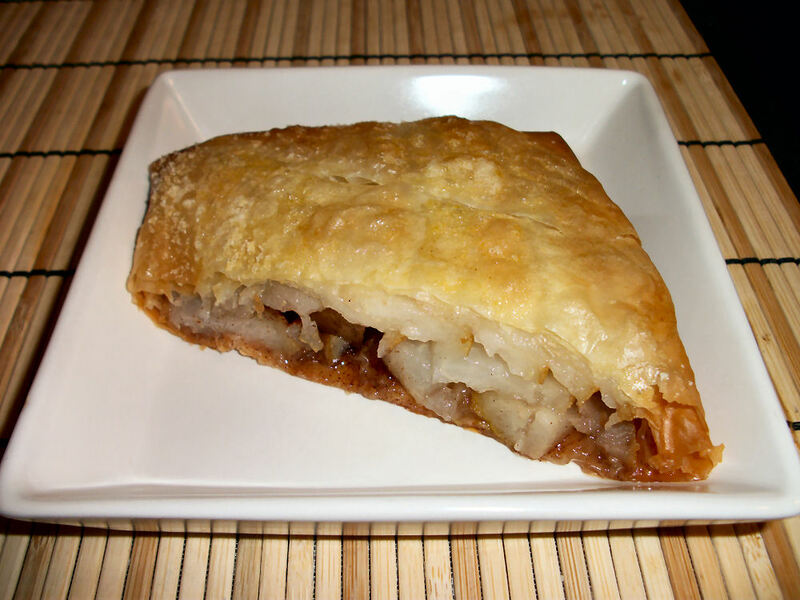 When it comes to strudel pastry I totally cheat. My grandmother was always a very practical woman. When something can be bought to help that dessert be successful she had no qualms about doing so. Phyllo dough is one of these short cuts my grandmother supported. Why go through the trouble of making it when the ingredient is right there? Now you can concentrate on the more important things…like the filling. Oh wait, that isn’t hard either? Well…score! Seriously, whipping up a strudel like this as a weeknight dessert isn’t all that hard. That’s exactly what this one was. Lay your first sheet of phyllo dough on a baking sheet. Spray with cooking spray. Layer another sheet on top. Repeat until all sheets have been stacked. Lay the cheese slices on the strudel sheets horizontally, not quite center. I usually go for about an inch off center towards me. Layer the pear slices on top. Sprinkle with cinnamon and splenda. Fold in the sides of the dough, then the bottom. Flip away from you to wrap. That moves the seam of your folding underneath the pastry. Spray the pastry. Cut four slits into the top and sprinkle with brown sugar. Cover with foil. Bake at 375F for 15 minutes, remove the foil and bake for an additional 15 minutes. Serves 4 generously. Each serving contains 141 calories, 3.9 grams of fat and 2.7 grams of fibre. I love pears and brie so creamy and sweet, apples would work with this too. If you don’t want the brie each serving will contain 116 calories, 1.8 grams of fat and 2.7 grams of fibre. Nothing wrong with a simple fruit strudel, I just like to get a little fancy sometimes hehe. This entry was posted in Comfort Foods, Craving Buster, Dessert and tagged Cheese, Cinnamon, pear, phyllo, vegetarian. Bookmark the permalink. Cheese and Pears always pair well. This looks really good. It’s on my “going to try” list now. Thanks! Welcome! Checked out your blog too and bookmarked. I adore cheese too and its always fun to get fellow canadian cheese advice.